Many schools are moving to project-based learning as a way to help students make meaning about content in deeper and more lasting ways than a lecture can provide. While those goals are clear to educators, and inspiring examples of schools successfully implementing the pedagogy exist, it can still be a challenging shift for many teachers. It is difficult to design projects that both help students learn required content and that genuinely interest them. 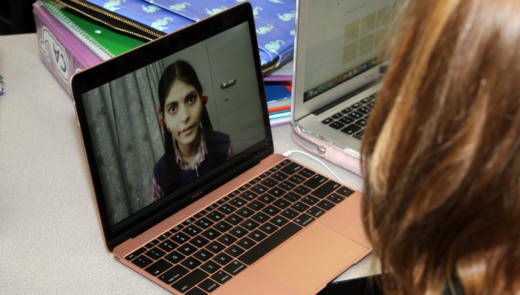 Some educators are finding that connecting projects to a global community is a powerful way to make a project feel meaningful to students. “I’m very much interested in how we can encourage young people to be active, engaged members of community,” said Mike Gwaltney during a presentation on project-based learning and global citizenship at the International Society for Technology in Education (ISTE). Gwaltney is now the principal of Rocky Hill School in Rhode Island and has been teaching for 25 years. His specialty is history, but he doesn’t think that should mean teaching the Gadsden Purchase anymore. “We ought to be teaching stuff that has real meaning for people,” Gwaltney said. He believes students are more keyed into global issues and current events than many adults know. The young people he has worked with care about what’s happening in the world around them. When teachers tap into that passion, students are capable of producing work that impacts the world beyond school. In 2014, Gwaltney was teaching at the Oregon Episcopal School in Portland when a shooting took place near the school. He knew that one way to handle the issue would have been to facilitate a discussion about the shooting with his class. But he wanted to localize the bigger issue of gun violence for his students. “Project-based learning is about doing something; it’s about active learning,” Gwaltney said. “It’s about getting involved in the subject. It’s not learning about math or about government, but how can I be someone in those fields.” After the shooting it became clear his students didn’t just want to talk about the pros and cons of gun control -- they wanted to do something to make their local community safer. So they wrote legislation and introduced it to the Portland City Council. When it failed, and various adults patted them on the back before sending them on their way, the students were indignant. Instead of giving up the idea, they partnered with other interest groups to sponsor and testify in support of a bill in the state legislature that would require background checks on private gun sales and close a loophole in Oregon state law. The bill passed; the governor signed it into law, and those students learned an indelible lesson about how government works. Their work had an impact; and along the way they came to understand it takes persistence to see results. They practiced less tangible skills like effective communication and collaboration with outside groups. And, perhaps most importantly, they also began to empathize with responsible gun owners through conversations with citizens and lobbyists testifying on the other side of the issue. “Wherever I go, I see the desire for opportunities to build citizenship,” said Suzie Boss, a journalist and project-based learning advocate who has worked with educators around the world on globally connected projects. “That’s one of the universals. How can we change the world together?” She sees many opportunities for this type of important work because there are so many thorny problems affecting every person on the globe. “My bottom line when you think about designing PBL, with global competency as one of the goals you want to get to, there needs to be passion,” Boss said. “You need to activate that passion in them by opening their eyes to issues they may not be aware of, or by listening to them about what they care about.” She said good projects usually start with an entry event that helps activate that passion and curiosity in students. After that, the second most important element is that the problem be actionable. “If we teach kids about the problems of the world without giving them a recipe for doing something, that’s just a recipe for depression,” Boss said. The problems need to be big enough to matter, but actionable enough that students feel they can make a difference. One of her favorite examples of this type of teaching has developed around the United Nations Sustainable Development Goals. These are big, lofty goals, like eliminating poverty, that will affect the future of the world. Crucially, they are works in progress -- the global community has not yet been able to solve these problems, which means there’s an opportunity for students’ work to make a difference. “These are [opportunities for] project-based learning for the world,” Boss said. She’s found that working with the Sustainable Development Goals has helped even the most content-first teachers she knows to embrace project-based learning. Boss worked with Jason Welker, an economics teacher who at the time worked for a rigorous private school. He didn’t want to do project-based learning because he didn’t think he could fit all the content he needed to cover into the short school year. Finally, he decided to give PBL a try in his environmental economics class. “He challenged his students in an economics class to pick one of those [U.N. Sustainable Development] goals that they care about and propose an action project using economic theory,” Boss said. One group got interested in climate action, researching carbon offsets as an economic mechanism to help solve the problem of climate change. Their theory of action was so well researched that their school ended up investing in their proposal. Tom Neville had a hunch that taking his eighth-graders to the cemetery would spark some powerful history learning, but he had no idea that what started as an effort to offer his students at the American School of Paris (ASP) an authentic project-based learning experience on World War I would take off the way it did. “The introduction to the project was folks from the American Battle Monuments Commission saying, ‘Look, we have all these folks buried here and we don’t know anything about them and we think you can help us with that,” Neville said. Students broke into groups, each taking the names of several American soldiers who fought in Europe, died and were buried in Suresnes American Cemetery. They began trying to figure out the back stories of the soldiers, intending to build an app for the cemetery so visitors could learn about who was buried there. As the project was getting off the ground, Neville read an article about two teachers on Lopez Island whose students had developed a gamified history app about sites around Washington state. Neville recognized a kindred spirit and reached out to Anthony Rovente and Tim Fry to see if they’d like to partner on the Monuments Project. Soon, Neville’s students in Paris were working with the Lopez Island students in the U.S. to find out what had happened to the 23 Washingtonians buried at Suresnes. “There is an excitement in the sense of scale,” Neville said. “Anytime we are engaged in something bigger than ourselves we feel that sense of camaraderie.” The U.S. students were emailing and calling local archives in Washington state while students in Paris were plumbing the French archives. Both classes shared their research and contributed to the app. In some cases, the students’ efforts prompted local archives to digitize their content for the first time. In others, family members of soldiers buried far away shared their personal memories, records and mementos with the students. And students collaborated with historians and archivists in many parts of the world to learn research tips and how to navigate archives. “The level of energy and investment I saw was really powerful,” Neville said. “You just want to bottle it.” He was impressed that his students persisted in their search, even when they made no progress for several weeks. But, Neville’s careful to point out that he had prepared his students for this type of uncertainty, a lesson he learned early in his efforts to do big real-world history projects. “It’s really more about developing a mindset and a culture within that learning space,” Neville said. He always starts the year using Eleanor Duckworth’s concept of Critical Exploration. The exercise forces them to accept uncertainty and to back up what they think they know with evidence, and gets them thinking like real historians. “Without that mindset you’ll have different reactions from kids who are hitting walls,” Neville said. He uses Critical Exploration as a touchstone for students when they get frustrated, reminding them that valuable learning is happening even if they’re stuck. Despite the success of the Monuments Project, it was messy and logistically challenging. The nine-hour time difference between Paris and Lopez Island made global collaboration difficult. Partway through the project a teacher at Stuyvesant High School in New York City wanted to join, further complicating matters. But as interest about the program grew among educators in the U.S., Neville decided to try to scale the project. He’s now working with an old co-worker, Patrick Cronin, to create a nonprofit that can support social studies teachers to do similar projects based on the soldiers in their local cemeteries. “The goal of finding out how to scale this effectively is not just to expand the Monument Project, but to expand the pedagogy,” Neville said. He knows not all teachers work in environments as supportive of global projects as APS -- he’s even worked in some -- but he’s convinced when teachers experience the level of engagement and quality of work he saw in his students, they’ll be excited to jump on board. And, he can’t think of a better way to instill the importance of history in students than by introducing them to the tools real historians rely on to discover untold stories that resonate beyond the classroom. Student reflections on the process and the power of adding to the world's knowledge are a bit motivator for Neville. In a blog post for the Monuments Project a Stuyvesant student, Dawei Huang, writes: "Simply said, the experiences of individual soldiers are often overlooked by historians, and Stuyvesant students were now helping do the work. For myself, I feel like there is great significance and satisfaction lifting the lives of soldiers reserved for the footnotes of history to the forefront of our attention and appreciation." Tammy Dunbar has been connecting her fifth-grade students at Lincoln School, a public K-8 in Manteca, California, with international classrooms for years now. It’s become a standard part of her teaching. She got interested in collaborating across continents through her own global community of peers and brought that enthusiasm to her class. For example, an educator friend in Belgium told her about his plan to do a big project on gender equality. Around that time, Dunbar was hearing a lot of anxiety from her students about President Trump’s campaign promise to build a wall between Mexico and the U.S. Dunbar’s students, about 70 percent of whom are Latino, were worried about what would happen to their families. The two teachers joined their themes in the Human Differences project where they explored the visible and invisible walls that humans put up. Eventually, classrooms all around the world joined the project, sharing the walls that characterize their countries and cultures. In week one of the project, students explored the various kinds of walls they notice in their communities, both physical and invisible. They researched and discussed with their classes, but then made videos to share on the Human Differences site that other classes could watch. The second week focused on gender equality, a topic Dunbar’s students didn’t think was a problem at first. Then they watched the videos uploaded by partner classes in China and India. “It kind of opened their eyes to what’s going on in the world,” Dunbar said. Those videos prompted students to think more critically about gender equity in their own homes and communities, leading to a good discussion. In the third week, classes discussed real walls. They studied the Berlin Wall and the Great Wall of China. Dunbar’s fifth-graders talked about what makes a wall good or bad, and they talked about the wall President Trump wants to build, as well as what their class might do about it. When they shared their reflections on physical walls with other classrooms around the world, they learned that the leaders of countries in Latin America live in houses walled off from the people. Dunbar’s students were sympathetic to their faraway peers, and felt validated in their own concerns about a wall along the border. In week four, classes explored the idea of bridges and how people can build bridges instead of walls. Dunbar’s class Skyped with students in Canada and Nigeria to learn about their lives. “The teachers really took the questions and ran with them because every country has their issue and things that are happening,” Dunbar said. “This gives them a platform to talk about it with their kids.” The project was flexible, but still provided contact with students in other parts of the world with different worldviews and realities. Along the way, Dunbar knows her students were honing skills like respectful listening, questioning, communication, presenting, research, writing and critical thinking. This year, Dunbar is kicking off the school year by reading Lois Lowry’s book “Number the Stars” with her class and her friend Emma Naas’ class in Sweden. The two classes have different perspectives on the story based on their geography and history, but are learning a lot from one another by reading together. Many of the teachers doing the most elaborate globally connected projects are anomalies in their schools. They are individually invested in helping students develop global competencies and have taken on the extra work of connecting with international educators interested in Skyping or finding education-based programs that include a global dimension. Not all teachers have the inclination or time to do that legwork. There are several organizations working to smooth the way for schools that value global projects. One such company, Level Up Village, focuses on providing science, technology, engineering and math (STEM) content through an online platform that also connects U.S. classrooms to those abroad. The founder and CEO, Amy McCooe, realized that kids in Kenya were learning about electricity at the same time as kids in the U.S. She saw the curricular connection as an opportunity to create connections between U.S. students and international students. Kids are partnered up and each week they upload videos talking about the issues in their own communities. They start off by sharing personal details, but eventually end up communicating about what they’re learning and how it is connected to issues in their local communities. In the model, the U.S. schools pay $55 per student for the service, and part of that fee goes to the partner school to pay for the technology and curriculum there. The Level Up Village program intentionally includes introductory online courses for teachers to help them increase their own global competency before being asked to teach it to students. The course talks about equity and empathy, emphasizing that respect is conveyed differently in different cultures. They talk about how important it is for students to learn to say their partners’ names correctly and how different body language cues might be misunderstood. Carrie Brown teaches English and History to sixth-graders at Girls Academic Leadership Academy (GALA), an all-girls STEM school in Los Angeles Unified School District. When her principal said they would be using Level Up Village, she was initially skeptical. As a 27-year veteran teacher she doesn’t like being told how to run her class, but she checked it out with an open mind and decided it was worth a try. “I did not expect to love it as much as I did,” Brown said. She doesn’t feel particularly tech-savvy, but found the three hours of introductory work provided by the program sufficiently prepared her. She can’t imagine doing all the work to find a partner class in Kenya, ensure the quality of the videos, enlist translation services and make sure the experience drives toward academic goals. “I liked that [my students] were very independent,” Brown said. “I loved the interactions. I liked the self-directed projects.” She liked that the curriculum was flexible enough that she could spend a lot or a little time on it each week. Like many teachers, she’s careful what she spends class time on, but found the conversations, revelations and enthusiasm of this international partnership to be well worth the time investment. While many Level Up Village courses focus on STEM, they also have a course on leadership taught through Malala Yousafzai’s autobiography “I Am Malala: The Girl Who Stood Up for Education and Was Shot by the Taliban.” Reading the book and talking about it with girls in Kenya upended some of the preconceived notions students held -- like the assumption that everyone gets to go to school for free. One student’s partner didn’t upload a video by the deadline. When Brown inquired, she found out that the girl was no longer in school because her parents couldn’t pay the school fees. That prompted an important discussion in Brown’s class. And students took the experience home to their families as well. Brown says it’s the first time in her career that she got emails from parents about the engaging, lively discussions they were having over dinner about school. While teachers continue to discern the most impactful ways to use technology in classrooms, one fact is inarguable: Technology makes the world smaller. Teachers can find inspiration in the work of colleagues across the world and students can learn together. That powerful capacity can bring new dimensions to classroom learning when leveraged by a skillful teacher. *A previous version of this article stated that students at American School of Paris built the Monuments Project app. In fact, they used the same platform Lopez Island students used the year before.